No matter how young or old we are, we will always love wearing graphic tees. These tees' bold designs and in-your-face typography have been around for years. If styled the right way, they can easily add attitude and personality to an otherwise dull ensemble. Here are a few we have our eyes on! Cats, over the years, have meowed their way to the fashion front. 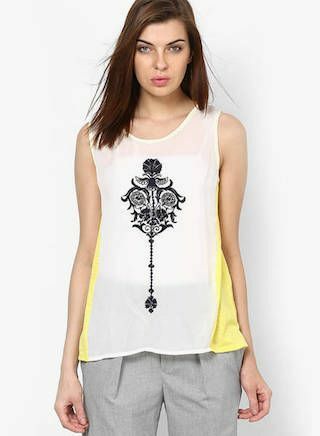 We love this relaxed muscle tee with the coolest print ever. Wear it under a chic blazer to go that extra mile and look like a fashionista! Price: Rs 498. Buy it here! 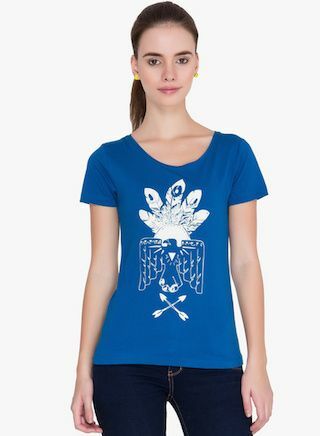 Spread some love by donning this cute little cropped graphic tee! You know this world needs it. Love the details on the sleeve that give this tee a cool varsity wear vibe. Price: Rs 399. Buy it here! 3. Hey Mickey, you’re so fine! If anyone says you’re too old to be wearing Disney inspired clothes, stay away from them! You don’t need that kind of negativity in your life, but you do need this Mickey Mouse cutout tee. Pair it with skinnies or a pencil skirt for an effortlessly chic look! Price: Rs 479. Buy it here! 4. What did the fox say? If you want to wear a graphic tee and still keep your look minimalistic, then this is the right pick for you. The graphic fox is all you need to take your outfit to another level. Price: Rs 439. Buy it here! 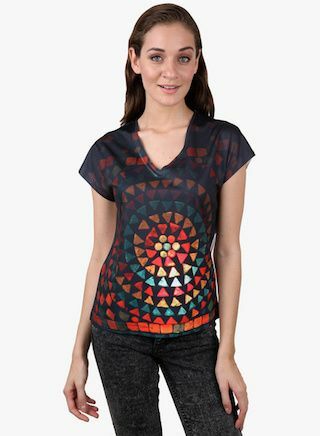 Splash some fun and colour to your outfit by throwing on this funky tee. This number is guaranteed to make you stand out in a crowd...for all the right reasons! Keep your accessories minimal. Price: Rs 399. Buy it here! We cannot deny how much we love this colourful representation of owls. 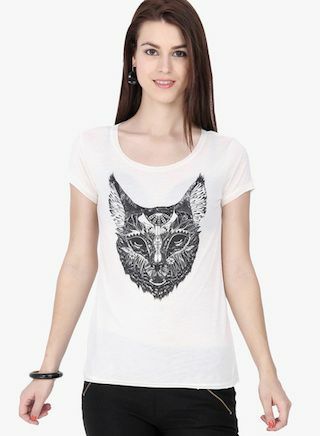 Whether it is in the form of accessories or the cutest printed tee like this one, we want it all! Price: Rs 399. Buy it here! Basic tees look the best in neutral hues of blue, gray and black. And when you stamp an amazing print on top of it, it gets transformed to the coolest graphic tee you need in your closet. That is exactly what this t-shirt is and we are in awe! Price: Rs 399. Buy it here! The subtle shades of blue in this one instantly caught our fancy. The design is soft enough to qualify as office wear or when you have to attend a semi-formal event. Price: Rs 479. Buy it here! Behold, all you Game of Thrones fanatics! This t-shirt is everything you have been looking for. Unlike other movie/series inspired tees, this one does not have that boxy element attached to it. 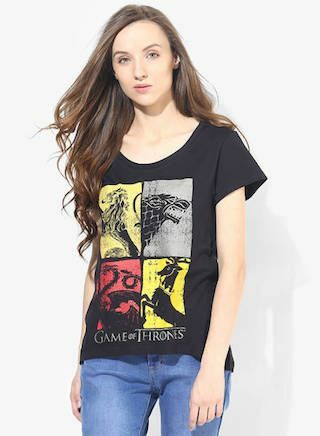 The fit and design is perfect for girls who want to show off their love for GOT! Price: Rs 479. Buy it here! This number comes in a flowy silhouette, making it the perfect pick for late spring and summer. The yellow highlights on the sides add the perfect amount of pop without taking the focus away from the print. What’s not to love?